This is our ultimate resource for ninja stars. It will be updated often as new stars become available or were made aware of them (last update 5/9/2017). 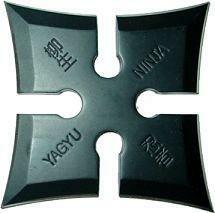 This page has several sections depending on the class of ninja star you are looking for. Go ahead and click ahead to just what you are looking for, or browse at your leisure. 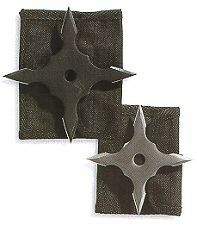 When it comes to choosing a ninja star there are several factors to consider. In our detailed reviews we cover 6 key topics which includes construction, durability, visual appearance, throwability, stickability and cost. 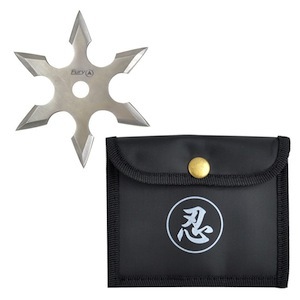 With any of the shuriken you are not going to get everything you are looking for. We very much choose more oriented towards throwability, stickability and construction. Look for a link to our detailed review in our lists here or go right to the review category, if you are looking for the best throwing knife our guide to the top 4 should help you out. As a general rule the more inexpensive stars are going to be constructed more poorly then your expensive stars. They are still fun to throw as long as you set your expectations a little lower as to their durability and overall performance. 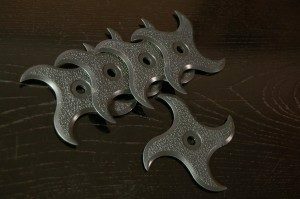 One of the benefits of throwing stars as a recreational pursuit is their relatively low cost which allows you to collect many styles for a relatively low investment. 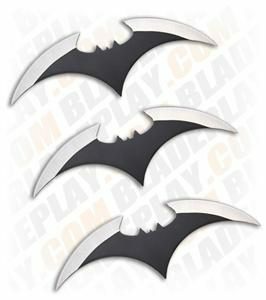 Well cover sharpened stars first, then on to unsharpened stars, toy or rubber throwing stars, throwing star sets and finally novelty ninja stars such as the popular batman thrower. There are many options and there is no right star for everyone. Continue to check back regularly here at ThrowNinjaStar as well provide comprehensive reviews of many of them. 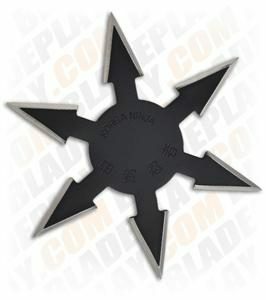 Condor Tool and Knife Senban Shuriken 420 HC Solid Stainless Steel 4 Point 2.5" Diameter These are classic form shuriken modeled after the Senban style of star. These were originally used as nail pullers, but you're not going to want to pull any nails with these beautiful stars. These are some of our favorites and they come in a set of 3 with a sturdy sheath. 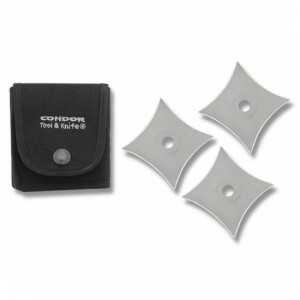 If you are looking for a classic throwing star that's well made and very throwable, this set is for you. 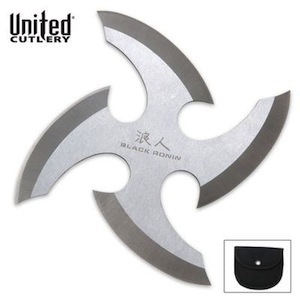 United Cutlery Black Ronin Silver Throwing Star Solid Stainless Steel 4 Point 3.5" Diameter We like the United Cutlery stars and this one is no exception. They are a little smaller than some but are very hefty stars. Our biggest con is the sharp edges throughout that make throwing it with a standard hold difficult. You can't beat the looks and aggressive styling. 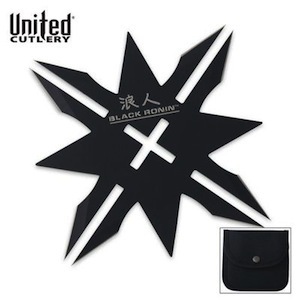 United Cutlery Black Ronin Black Throwing Star Solid Stainless Steel Construction with Black Powder Coated Finish 4 Point 3.5" Diameter We like the United Cutlery stars and this one is no exception. They are a little smaller than some but are very hefty stars. Our biggest con is the sharp edges throughout that make throwing it with a standard hold difficult. You can't beat the looks and aggressive styling in black. 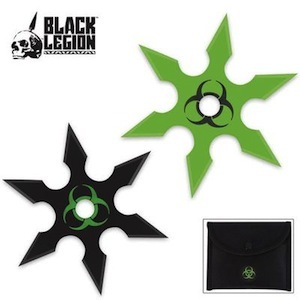 Black Legion Biohazard 2-Piece Set of Throwing Stars Painted Stainless Steel 6 Point 4" Diameter The Black Legion Biohazard Throwing Stars are a great intermediate option for the up and coming thrower. They look great and throw well although they lack the heft of some of the more expensive stars. But for the price they are a good option for everyday throwing. 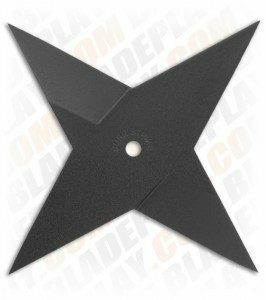 ZZ1 Weapons Professional 4 Point Throwing Star in Black or Silver Solid Stainless Steel 4 Point 4" Diameter These are a simple 4 point throwing star that are easy to throw and good quality at a great price point. 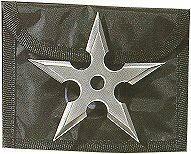 ZZ1 Weapons Professional 5 Point Throwing Star Solid Stainless Steel 5 Point 4" Diameter This a solidly made 5 point throwing star in a chrome finish. They throw well and come at a reasonable price. A good mid tier option. 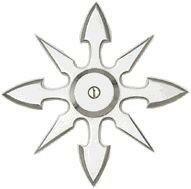 Fury Ninja Star Solid Stainless Steel 6 Point 4" Diameter This fury is a classic design. If you are a fan of 6 point or greater designs than this very well may be the star for you. It throws very well and has sufficient heft for it's size. 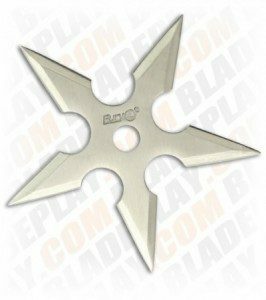 Fury 5 Point Ninja Throwing Star Solid Stainless Steel 5 Point 3.75" Diameter Another great Fury model, this time in a 5 point star. It's got a good heft too it and throws very similar to it's 6 point brother. 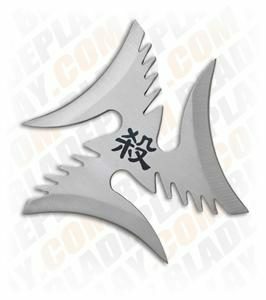 Cold Steel Medium Sure Strike Throwing Star Shuriken 80SSB Solid Stainless Steel with Baked Epoxy Finish 4 Point 5.75" Diameter This another amazing Cold Steel product and comes in 3 models, The Medium Sure Strike is 4.2oz and is suitable for mid to long ranges. 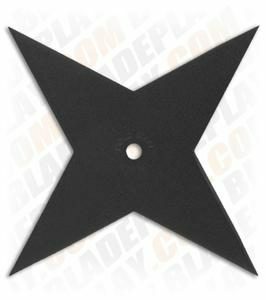 This is an excellent throwing star, it doesn't have the flashiness of some of the other stars but it is a proven performer. 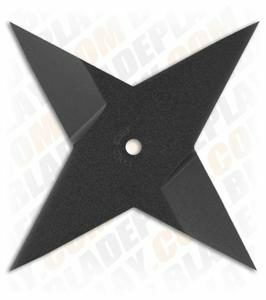 Ninja Kohga 6-Point Throwing Star (Black) Solid Stainless Steel Baked Black Finish 6 Point 4" Diameter This is a great star, in a nice 6 point design. It's very well made and it's 6 extremely sharp points make it easy to stick. 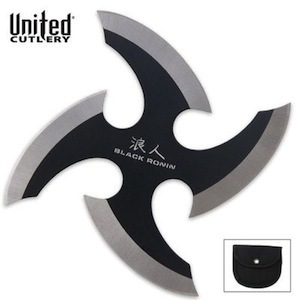 Tri-Blade Throwing Shuriken Star by Paul Ehlers Master Cutlery Solid Stainless Steel Baked Black Finish 3 Point 5.25" Diameter This is an extremely unique star although we're careful not to call this a specialty star. It's a real thrower but with carries a very aggressive stance. At 3 points it's not a guaranteed stick but due to it's heft and strong points you'll most certainly stick it. This is a very unique high end star with a very striking design. 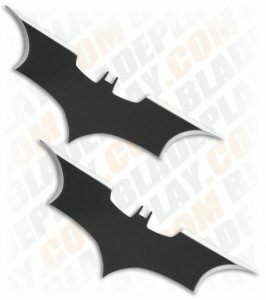 Black Large BatFlip Ninja Throwing Star (Set of 2) Solid Stainless Steel with a black coating 3 Point 8" Edge to Edge Again for the Batman fans these are a great set of throwing stars although they are quite large. 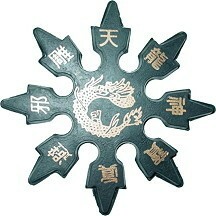 They throw reasonably well but like most of the specialty stars they are more for the style then true functionality. Since you have only 3 real points here they are trickier to stick then a traditional ninja star but tons of fun nonetheless. My son loves to throw these himself. The edges are indeed knife sharp so if you r throw is accurate you get good sticking capability. 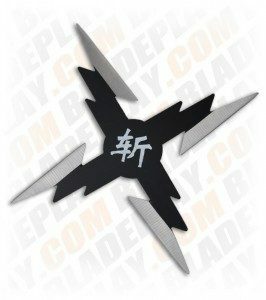 Volt 4 Point Black Throwing Star 1045 steel with black accents 4 Point 4.6" Diameter This is a lightning bolt take on the ninja star. It's really a relatively standard 4 point shape that has been spiced up design wise. The 4 points are sharpened and all in all throws well. A fun one if you like the design of course. 4 Kings Throwing Card Knives Solid Stainless Steel with Screen Printed Images 4 Point 3.3" x 2" This is a unique set no doubt about it. They are styled as playing cards but throw like a ninja star. Since they are rectangle they aren't a sure fire stick like you could achieve with a traditional star but they are super fun nonetheless. 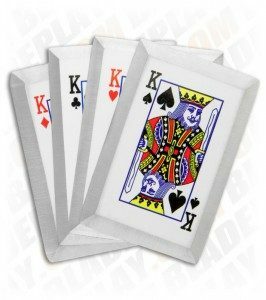 This set happens to be a set of 4 kings. The edge is chisel ground but is not quite knife sharp. That being said they still will stick well if thrown with some force. 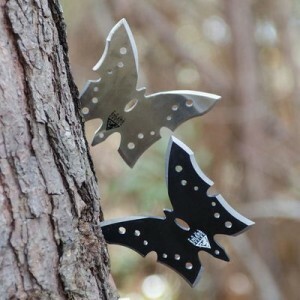 Paul Ehler Designs Butterfly Thrower Solid Stainless Steel 1 polished the other black coated 4 Point 3.75" Edge to Edge Bats a little too gross for you? How about a beautiful but deadly butterfly? This is a super cool set that throws remarkably well. It's such a unique design that we care for a great deal. The edges are knife sharp and we love that they come in a polished stainless and black version. Have a throwing contest with your friend and you'll easily see who's who. 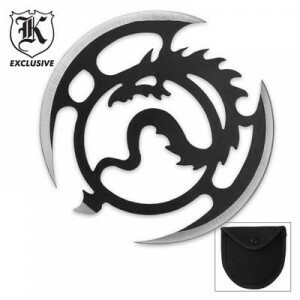 Flying Dragon Thrower Solid Stainless AUS-6 Steel with a black coating 4 Point Circle 3.75" Diameter Who doesn't love dragons really? 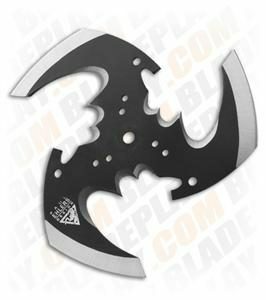 This is a really cool design that may be more suitable on your wall or a display case then out in your throwing range. Part of the reason for that is the throwability of this star. It's not easy to stick let's put it that way. This is basically a circle, and one that is only sharpened at the open points not the entire circumference of the star. This means that you have to get a lot of force on this one for a stick or hit one of the points. It's also more suited for just overhand throwing then a frisbee style throw. This star isn't for everyone but we love it's design. You have several options for purchasing stars but in many cases you are severely limited purchasing in a local store. Occasionally you can find a higher end knife store that may carry some. The selection is usually limited so for a much better selection online locations might very well be your best option. We have purchased from and recommend some of the below companies. Our guide above will link directly to the best options for each star.